Fifteen years after her death, this powerful collection includes selections from Jordan's poetry, essays, plays, letters, talks and more. Publishers Weekly named it one of the Best Books of 2017. "This book is not just a collection of fig-urative words; it is a tool for liberation." "This book is the rainbow sign after all the flooding across America." "Doesn’t holding these pages light your mind with impossible bravery?" "More than ever, as Brecht’s ‘dark times’ close in on our public life and our aspirations for social justice, we need June Jordan’s astute and lyrical observations, her outraged humanism, her clear-eyed love." ​Support your local bookstore by purchasing We're On at Indiebound. Also available though Amazon.com. This volume is a complete collection of June Jordan's columns for The Progressive, published between 1989 and 2001. Through her work, Jordan taught a concept of "life as activism," based on inclusiveness, consistency, honesty, and identification with the oppressed. The writings collected here can be read as a road map to such a life of activism. 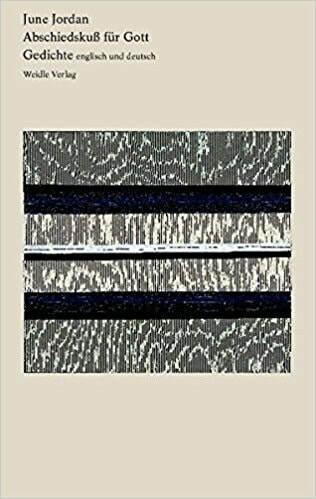 These columns provide a critical study of important issues from the end of the twentieth century, as well as a clear illustration of the intersections of many forms of injustice and oppression, celebrating a movement away from single-issue politics to a far-reaching activism. ​Support your local bookstore by purchasing Life As Activism at Indiebound. Also available through Amazon.com. A beautiful bilingual edition of Jordan's entire 1997 volume of poetry, Kissing God Goodbye / Abschiedskuss für Gott, translated by Julia Sattler and Walter Grünzweig with students of the Technische Universität Dortmund, Germany. In the spirit of Jordan's Poetry for the People, students and professors worked together on these translations. His Own Where was one of the first novels for young readers written entirely in Black English; in 1971 it was named as one of The New York Times' Most Outstanding Books, placed on the American Library Association's list of Best Books, and nominated for the National Book Award. It tells the story of Buddy, a troubled 15-year-old boy, and Angela, whose angry parents accuse her of being "wild." When life falls apart for Buddy and Angela is attacked at home, they take action to create their own way of staying alive in Brooklyn. ​Support your local bookstore by purchasing His Own Where at IndieBound. Also available through Amazon.com. 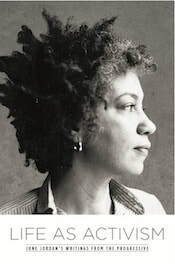 Directed by Desire: The Collected Poems of June Jordan gathers the work from Jordan's ten books of poetry and includes 70 never-before-published poems are a tender, fierce, and innovative series that she wrote before her death. Support your local bookstore by purchasing​ Directed by Desire at IndieBound. Also available through Amazon.com. Soulscript is a collection compiled by June Jordan "according to the dictates of the heart." Here, in the work of luminaries like Gwendolyn Brooks, Countee Cullen, Langston Hughes, Gayl Jones, Audre Lorde, Ishmael Reed, Claude McKay and Richard Wright--as well as in her own poems--Jordan's hopeful challenge brings cherished history into a common future. Support your local bookstore by purchasing​ soulscript at IndieBound. Also available through Amazon.com.